visual tour of H-R Poppin' Snacks in the Gibbon area. Video is courtesy of KOLN / KGIN / KSNB-TV 10/11. HR Poppin' Snacks featured on NTV's "Good Life"
7-01-03 -- HR Poppin' Snacks is now distributing five of the most popular flavors through Cash-Wa distributors. Flavors include: Caramel, Cheese, Cinnamon, Kettle Corn and Rainbow . 6-01-03 -- HR Poppin' Snacks received the Blue Ribbon for their exclusive Cashew Almond Toffee. 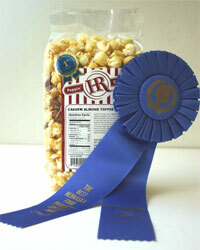 The ribbon was awarded at the Best Nebraska Food Products Contest in the Candy and Nuts division. Popcorn has to have the correct moisture in order for it to pop. Without moisture -- 13.5 percent to 14 percent per kernel is needed -- popcorn can't pop. That's why it's important to store popcorn correctly. So what's the best way to store popcorn? Airtight containers -- plastic or glass -- are your best bet to avoid moisture loss, especially when stored in a cool place like a cupboard. Avoid the refrigerator. With the invention of the television in the early 1950's, and it's rapid growth in popularity attendance at movie theaters dropped and, with it, popcorn consumption. With the popularity of home theaters and video and DVD rentals, popcorn consumption is back on the rise. Americans today consume 17 billion quarts of popped popcorn each year. The average American eats about 58 quarts. There's no such thing as "Hull-less" popcorn. In order for popcorn to pop it must have hull. There are varieties that have a less noticeable hull after it has been popped. But, there are no varieties that are completely "hull-less". HR Poppin' Snacks uses an exclusive patented "mushroom" kernel that is more dense and compact. When popped it resembles a ball and is ideal for flavor coatings and caramelizing. Our exclusive popcorn reduces the amount of breakage you normally see in the bottom of a bag. Site includes historical information about popcorn for teachers and students. Several versions are available; Flash™, html and also Spanish language.